SOCCER NEWS - Asia's football body promised a "thorough investigation" on Wednesday after the United Arab Emirates' turbulent Asian Cup semi-final loss to arch-rivals Qatar, during which fans hurled shoes and bottles. 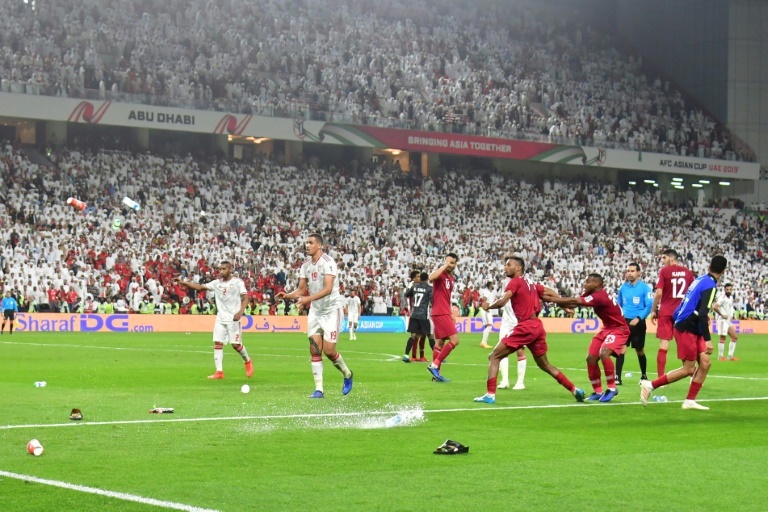 Plastic water bottles pelted the turf and several shoes were hurled, an Arab insult, as Qatar celebrated the second goal in Tuesday's 4-0 rout of the tournament hosts in Abu Dhabi. Akram Afif twice had to delay taking a corner as objects rained down, and Salem Al-Hajri was struck on the head after Qatar's third goal. One plastic bottle struck the crossbar behind Qatari goalkeeper Saad Al-Sheeb. "The AFC (Asian Football Confederation) is conducting a thorough investigation into events at the (semi-final)," a spokesman told AFP. "Once the investigation has been completed the AFC will decide on the appropriate steps." The defeat was deeply embarrassing for the UAE, who are in the midst of a stand-off with Qatar in which several countries have slashed diplomatic and transport links, claiming Doha supports terrorism - a claim the Qataris deny. Abu Dhabi authorities bought thousands of spare tickets and handed out them out to fans with Emirati identification, meaning the 42,000-capacity Mohammed Bin Zayed Stadium was nearly unanimously behind the home team. "Everybody knows about the problems but we don't care - we just play football," Qatar defender Pedro Correia told AFP. "Let the people talk, winning 4-0 is more important."